New York City may seem to be fast losing its diverse flavor thanks to rising rents, but Arthur Avenue is standing up against the tide. It celebrates its rich Italian heritage and other cultures with restaurants, grocery stores, and shops, all in compact mixed-used buildings. Diners at the Arthur Avenue Retail Market. Photo courtesy the Office of the Bronx Borough President. The notable cultural streetscape comprises an almost half-mile stretch of the street between 184th and 187th Streets beyond St. Barnabas Hospital in the Belmont section of the Bronx. The Arthur Avenue streetscape. Photo courtesy the Office of the Bronx Borough President. If you ask real New York City insiders where to find Little Italy, they won't point towards lower Manhattan. Instead they'll direct you to the Bronx, where Arthur Avenue serves as the central artery for the one of the city’s major ethnic enclaves. 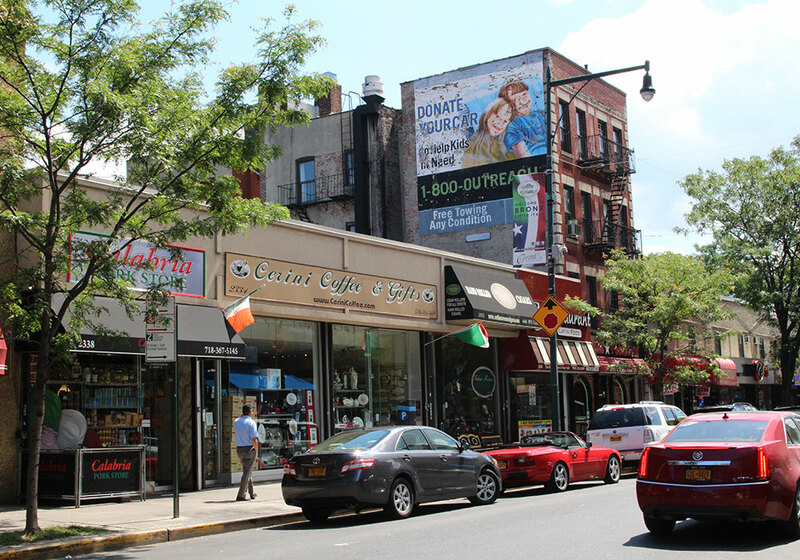 Arthur Avenue is an exceptionally rich streetscape lined with restaurants, grocery stores, and shops promoting Italian heritage, dating back to large Italian migration starting at the turn of the 20th century. Nearly every shop is an institution, passed down through generations of families that have lived in the neighborhood. 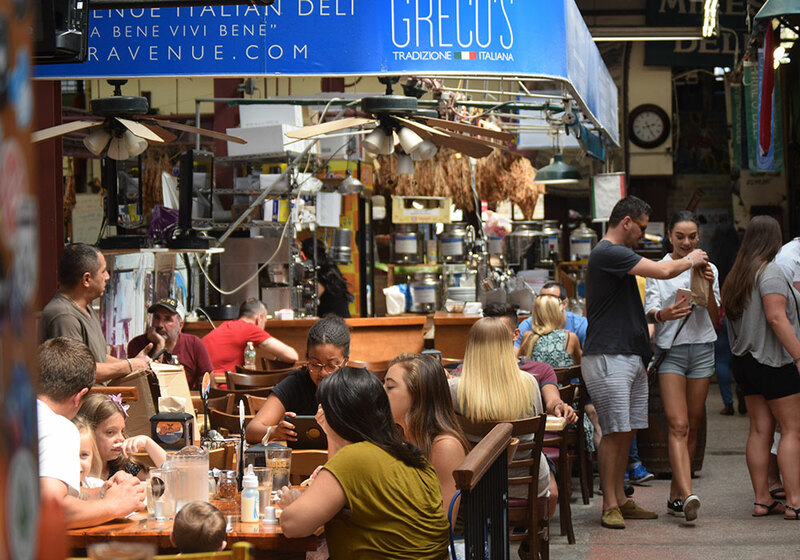 There is no better place to sample delicious bread, pasta, sausage, or espresso — the Zagat Survey readers repeatedly give “Best Buy” status to more Arthur Avenue shops than in any other neighborhood in New York City. The neighborhood is also home to the Enrico Fermi Library and Cultural Center, which serves as a neighborhood gathering place as well as a repository of Italian and Italian-American literature. Perhaps the most defining characteristic of Arthur Avenue is its centralized retail market, the first of its kind. Mayor Fiorello LaGuardia spearheaded the Arthur Avenue Retail Market, opened in 1940, to provide a central gathering space for the 50,000-some pushcart vendors doing business along the thoroughfare. Today, many vendors in the market carry European products not found in most American grocery stores. One of the market’s staples, Mike's Deli, was featured on the Food Network’s Throwdown with Bobby Flay. Regardless of their political leanings, presidential candidates will regularly come to Mike's Deli to woo voters who regard the shop as a culinary mainstay fit for our country’s leader. Arthur Avenue is also the center for New York City's Albanian community and a major spot for Mexican and Central American immigrants. The influx of new groups shows how a new generation of immigrants will come to find its way in the big city, much like the Italians on Arthur Avenue have for decades. 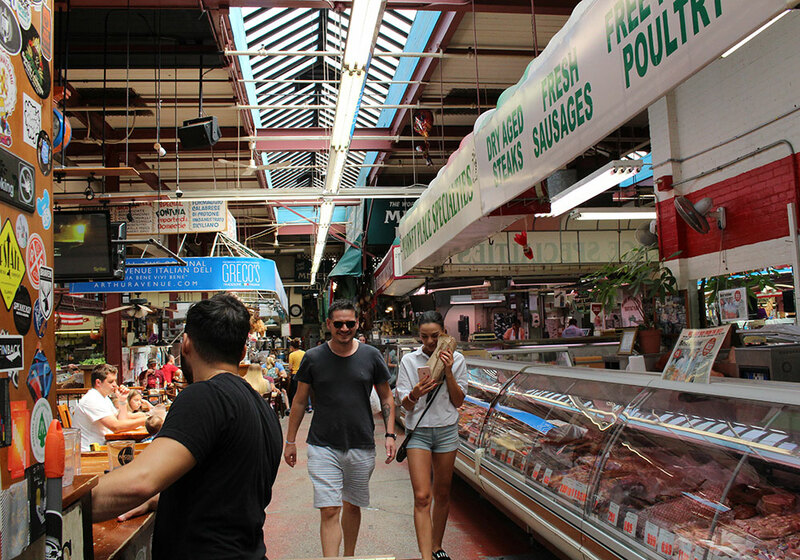 Pedestrians at the iconic Arthur Avenue Retail Market. Photo courtesy the Office of the Bronx Borough President. Well-maintained streets and sidewalks support the constant flux of residents. Tree-lined streets provide plenty of shade, while street lighting promotes 24 hour a day use. All buildings are mixed use, with residences above and shops below. Tourists visiting the Bronx Zoo, New York Botanical Garden, and Fordham University often walk to Arthur Avenue to enjoy its ethnic delicacies and numerous street festivals. The street is within walking distance of a major bus interchange and Metro-North station at Fordham Plaza. 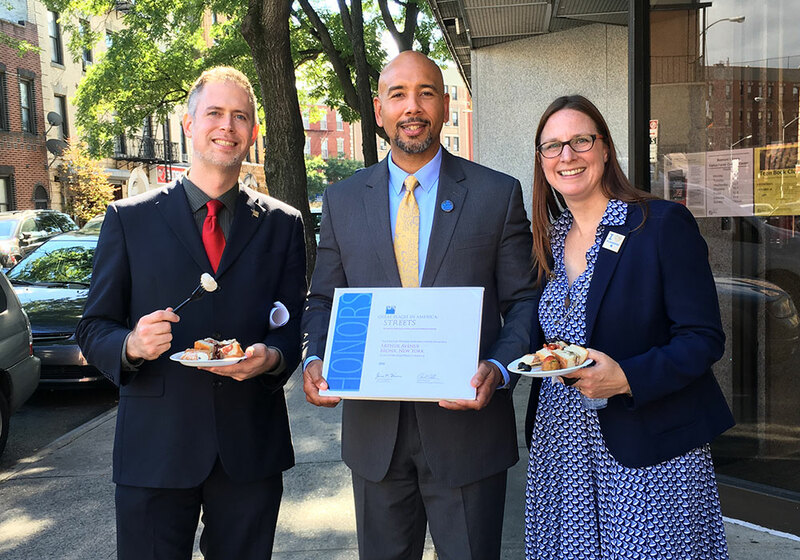 There are numerous street fairs throughout the year along the main thoroughfare, highlighting the area’s excellence in community programming. Ferragosto, the yearly celebration of Italian culture, floods the street with music, culture, and delicious food in August. Since 2015, Arthur Avenue has been hosting the Bronx Little Italy’s Car Show in May to show off nice cars with food, music, and prizes. Belmont is bringing Italian tradition back to the Bronx with the “Dancing of the Giglio” in conjunction with the Feast of St. Anthony of Padua in June. The Giglio is a hand-made wooden statue that contains the images of saints. It measures 50 feet high and weighs several tons, requiring over 100 lifters to hoist it through the streets. APA's National Planning Conference will be held in New York City in 2017. Stay tuned for news of events on Arthur Avenue. 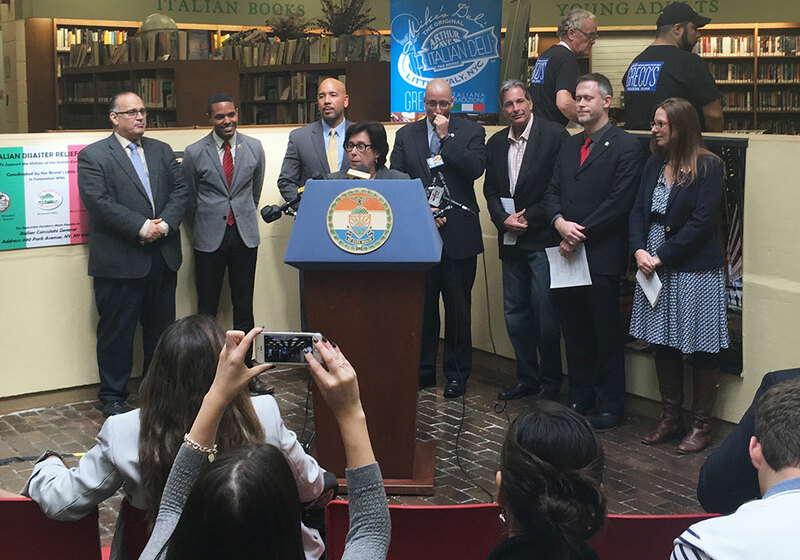 Iris Weinshall, New York Public Library Chief Operating Officer, kicks off the Arthur Avenue event. Photo by Michael Johnson. 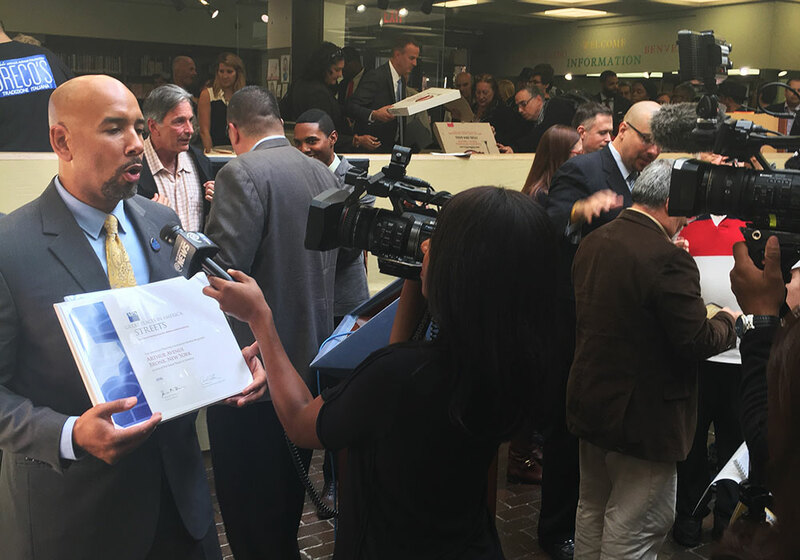 Bronx Borough President Ruben Diaz Jr. fields questions from local reporters about Arthur Avenue. Photo by Michael Johnson.